The Nintendo Entertainment System (NES) is an 8-bit, third-generation console released on July 15, 1983 in Japan, where it was known as the Family Computer or Famicom, and on October 18, 1985, it released in the US. It retailed for $179 ($419 in 2019 money). It had a Ricoh 2A03 CPU at 1.79 MHz with 2KB of RAM. The Family Computer Disk System (FDS), a Japan-only add-on which played games from a special proprietary magnetic disk format strongly reminiscent of floppy disks of the time. It offered slightly higher data storage and slightly enhanced sound processing. It also had a microphone never found anywhere else. There were plans to release it in the US, however since the NES itself had its launch delayed to late 1985, and the mapper solution obsoleted it, the add-on was never exported and some of its exclusives were ported as regular cartridge releases. Memory Management Controllers (MMC), also known colloquially as mappers. They solved every single problem above with bank switching for much more data, onboard FM audio chips, and much more. Most games released after 1986 that really pushed the system to its limits used mappers. A similar solution was used for the Game Boy. Emulation for the NES is robust, with many high-quality emulators for various systems. Like for Game Boy/Color, tons of NES emulators exist. For a list of open-source projects, see this GitHub query. * AoEX is based on NesterJ 1.12 Plus 0.61 RM, so it includes features like rewind, cheat code support, rotated/mirrored screen, sepia palette, support for rare mappers (the pirate bootleg FF7 works on it), etc. Its compatibility is inferior to 1.13 beta 2. ** Only available on consoles as a libretro core (e.g. RetroArch). *** Only available on mobile as a libretro core (e.g. RetroArch). Mesen is the most compatible NES emulator according to currently established NES test ROM suites. It should be the emulator of choice for those who desire the utmost accuracy. Mesen is also very user-friendly and supports a lot of features that other emulators are missing such as; HD packs, netplay, auto-updating, good built-in filters, both .zip and goodmerged file loading, etc. puNES is the second most accurate NES/FDS emulator according to a separate test battery run by the TASVideos community. It should be noted that puNES used to have one mapper that Mesen didn't: 116, which allows games like Kart Fighter and Somari to be supported. This has since been added to Mesen. Nestopia also has a high ranking in those same tests. Even so, Nestopia has issues with The Young Indiana Jones Chronicles and doesn't display the status bar in Mickey's Safari in Letterland correctly (among other problems). Nestopia Undead Edition is a fork of Nestopia meant to keep it alive and fix the aforementioned bugs. This version is generally recommended over vanilla. Even the libretro core for Nestopia is in the Undead Edition. Nintendulator and My Nes also have a fairly high ranking in those tests. FCEUX scores rather low in these tests, despite being a recommended emulator on TAS Videos. The New PPU is more accurate than the Old PPU, thankfully. The emulator is still useful, though, thanks to its robust Lua scripting and incorporating FCEUmm into its feature set. VirtuaNES also scores quite low in the tests, but in turn supports several obscure peripherals that are not available on other emulators. For official emulation, there is Nintendo's own Virtual Console or Nintendo Switch Online. The Wii has a significantly larger library of NES games to choose from than the 3DS or Wii U, especially from third-party publishers. There are many other NES emulators not listed here, as the NES has more emulators than any other system (new ones are started all the time). Only those that are well known or stand out in some way are covered here. A key difference between many emulators nowadays is how many mappers they support. No Mapper: Supported on every emulator even official Nintendo emulators. Official Mappers (UNROM, AOROM, MMC1-6): Most emulators, as well as Nintendo's Virtual Console (but not their GBA emulators), will cover these. Third Party Mappers (Various: e.g. Konami's VRC6/VRC7) While officially licensed by Nintendo, they were not allowed outside Japan. As a result, for their Western releases, many games that took advantage of their features (advanced ROM mapping, extra sound channels) were reprogrammed significantly and shipped on the official mappers, often with simplified soundtracks. A lot of fan emulators worth their salt will cover these. With those, you cover the entire officially licensed library. Unlicensed Mappers: Mostly used by pirate cartridges, often long past the console's official commercial lifespan. Only the more accurate emulators (Mesen, FCEUX) will even bother covering them in a whack-a-mole quest for every new one discovered to this very day. If you're not interested in unlicensed Chinese or Russian bootlegs or newer unofficial NES demakes, it isn't a problem. The NES ROM information isn't sufficient to describe the cartridge and emulate it, so emulators have to include the layout and behavior of these mappers in their code, while the ROM header tells the emulator which mapper to choose. So unlike with other consoles, no matter how accurate a given NES emulator will get, it will still never be able to run newly discovered ROM dumps from cartridges that used a so-far unknown mapper. Thus, Unlicensed NES support will be inevitably incomplete and a constant work-in-progress, hence claims some emulators are "inaccurate". Related to this issue: This is why most emulators won't run unheadered NES ROMs. Newer versions of Nestopia can open those, but they're handled in a slightly different way: the information that would have been included in the iNES header is instead provided in emulator configuration files that get summoned as long as the ROM's hash matches exactly the No-Intro dump of that given game (which is inconvenient for romhacks). .fds format: Most common format. Ubiquitous in ROM sets (GoodSets, No-Intro). Omits some checksum data. .qd format (stands for QuickDisk): Only ever used in official Nintendo re-releases. Almost identical to fds, but a full dump with checksum data. May omit padding. The checksum data in question would be checked at BIOS startup to verify the integrity of the image and whether it was tampered with, in which case it will throw an anti-piracy error. As of now, no NES emulators support the alternate more complete dumps, as well as fudging that check's result to always return a negative. To emulate a .qd image, stripping the checksum data with a custom script is needed. Several NES games need their overscan to be cropped to look proper. Unfortunately, there is no standard level of overcropping. Many games require different levels for best results. 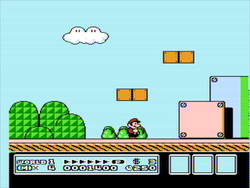 For example, Super Mario Bros. 3 requires quite a bit of cropping, however, the same level of cropping will obscure the letters of the status bar in Castlevania games. Unlike consoles such as the SNES, which natively generate their image in pure RGB, the Famicom normally generates and outputs an encoded NTSC video signal. This must then be decoded by the TV's built-in NTSC decoder, which means the resulting color palette often varies depending on the display's decoder. For this reason, NES games will appear to have different colors on different TV sets. To properly emulate this part of the NES experience, many Famicom emulators have a variety of different palettes to choose from. The 3DS and Wii U versions of Virtual Console use extremely dark color palettes. This is apparently not an accuracy issue, but rather an anti-epilepsy measure. For the Nintendo Switch Online service, the games were directly edited to remove seizure-inducing patterns, allowing it to use a normal palette. There were many accessories released for the NES but Emulation General only covers accessories that are truly differentiated data streams from the basic controller. For example, the Power Glove is in actuality just a really complicated NES controller, designed to convert motion into D-PAD, SELECT, START, A, and B button commands. The same goes for R.O.B. and his Stack-up and Gyromite games because he was really just the second player. Strangely, the Famicom has a lot more peripheral hardware to emulate than the NES. This accessory was very common. It's a light gun, used for many games such as Duck Hunt, Wild Gunman, and Hogan's Alley, to name three examples. When the trigger is pulled, the screen flashes black for a period of 1-2 frames while displaying a white rectangle (indicating the target to shoot at). If the gun detects it is pointing at the white rectangle, it tells the game to register a hit. On real hardware, this could be quite unreliable unless the lenses were thoroughly clean. The Zapper plugged into the P2 port and mainly worked with old CRT TVs; newer LCD TVs will not register with the Zapper. Many emulators support this accessory with 100% accurate hit detection in the form of a mouse click (PC), tap (for mobile), remote (Wii ports of NES emulators), or faked pointers using a controller. This controller was released by Taito with one button to "fire" and a dial to control back and forth movement. Arkanoid and Chase H.Q. are the only NES games to utilize it, but it is still optional even so. Mesen and puNES support this. By the Software Toolworks, the Miracle Piano Teaching System used an electronic piano keyboard as input. It is unknown if any emulator supports this feature. This was designed to be used with your feet, typically by running in place on numbered circles to represent the button presses. It plugs into the P2 port and has 12 different buttons. Notable games such as Stadium Events, World Class Track Meet, and Athletic World, utilize this, and trying to use a standard controller is not an option. Despite being less accurate than puNES or Mesen, FCEUX actually supports this. This turned the standard two controller ports into four by plugging into both P1 and P2. A few games utilized this capability, such as LJN's A Nightmare on Elm Street. Many emulators support this feature by having an option to switch between 2-player and 4-player mode or just enabling/disabling Player 3 and Player 4's controller. Technically not a peripheral because it was physically part of each Model 1 Famicom, on the second player's controller is a microphone and volume slider instead of having the START and SELECT buttons. One noteworthy game that makes use of this is the Japanese Legend of Zelda. Pols Voice, an enemy, is destroyed if the player makes a loud sound into the microphone (the US version changed this to merely firing an arrow to 1-shot them). Another game to make use of the microphone is Takeshi no Chōsenjō (Takeshi's Challenge). VirtuaNES supports this, activated by tapping the 'M' key on default settings. Mesen also supports this. The 3DS and Wii U versions of Virtual Console are currently the only emulators that support input through an actual microphone, though puNES has this feature planned. Separate from the built-in microphone, Bandai made Karaoke Studio, which is a special game cartridge that has a microphone attached to it. It is unknown if any emulator supports this feature. A Japan-only peripheral using a magnetic disk format instead of cartridges, with its own unique game library. Some of these were later ported to the regular NES/Famicom cartridge format with significant downgrades (particularly the loss of enhanced FDS hardware audio). This accessory made it possible to save game data without needing battery-backed ROM, but only for the game contained on each of the disks. You'll need the BIOS file to emulate games made for this add-on, which can be found here. It's interesting to note there are actually two versions of the BIOS; Nintendo's peripheral and Sharp's Twin Famicom. The only difference is Nintendo's displays Nintendo while Sharp's displays Famicom when the hardware is first booted. Other than that, they function identically. Only one game used a keyboard to program in BASIC on the Famicom and that was Family BASIC. VirtuaNES supports it. The Data Recorder is an accessory related to the Famicom Keyboard. Three games and one accessory supported the Data Recorder: Excitebike, Mach Rider, Wrecking Crew, and Family BASIC. These sent an analog audio stream through the keyboard to a cassette tape deck, but really any device capable of analog audio recording/playback can work with it. The "sounds" are really just 0s and 1s to represent the data the games are trying to write. VirtuaNES supports this accessory, controlled from the "Tape" menu. Different from either battery-backed ROM cartridge or the FDS, ASCII Corporation (based in Japan) created their own method to save game data with the ASCII Turbo File. VirtuaNES supports this too. This accessory was a tablet for the Famicom games Oeka Kids: Anpanman no Hiragana Daisuki and Oeka Kids: Anpanman to Oekaki Shiyou!!. Mesen and VirtuaNES supports it. Although most emulators, in general, have a GUI to manage cheats and don't rely on real hardware cheating devices, FCEUX can cheat authentically using a Game Genie ROM. An arcade system based on the NES released for the US. Most emulators have an option to let you "Insert Coin(s)". ROMs made with VS System in mind which are accidentally played in the emulator's NES mode (or vice-versa) will cause the colors to be totally garbled. This can occur when there is an issue with the emulator's configuration or the ROM's iNES header. Also re-released later as Sharp's FamicomStation. The hybrid NES/Famicom arcade box Nintendo Famicom Box is a bulky metal cube, with a slot to insert money and secured with tons of locks. The hotel would set the amount of time you could play on one token, and choose the games available. You can see it in action in season 18 of Game Center CX. It was distributed in select hotels and stores and can hold up to 15 select Famicom releases at once, and had many more hardware lockout chips and pins with different behavior than usual (it also only supported cartridges using memory mapper 0). Sports a unique boot screen for both models released. Neither the cartridges nor the BIOS has been dumped or tested with an emulator, unlike the Super Famicom Box (which has had both its BIOS' and most of its ROMs dumped). A pirate NES Famicom clone which was sold in Russia and Eastern Europe, with the blueprint later reused for other Famiclones. Here's a link to a CC-subtitled Kinaman video for more details. It's a very quirky NTSC NES optimized for 50Hz, with many other changes from the official PAL NES as well- through these differences often break the compatibility of Dendy-specific releases on most emulators. MESS supports this console, and some other emulators (such as Mesen, puNES, and FCEUX) introduced support for it in r3134, along with the already included support for iNES 2.0 ROM headers (including the option to mark a ROM region as PAL Dendy). The cartridges themselves can still be played as long as the emulator supports broken carts. Nesdev Wiki - A place for all your NES programming/NES emulator programming needs. Nesdev Forum - Discussion of NES Wii Virtual Console accuracy.